As we were walking in Chelsea, we stumbled upon Co Ba, a small Vietnamese restaurant and decided to have lunch there to try their banh mi, a Vietnamese sandwich made with a French baguette. 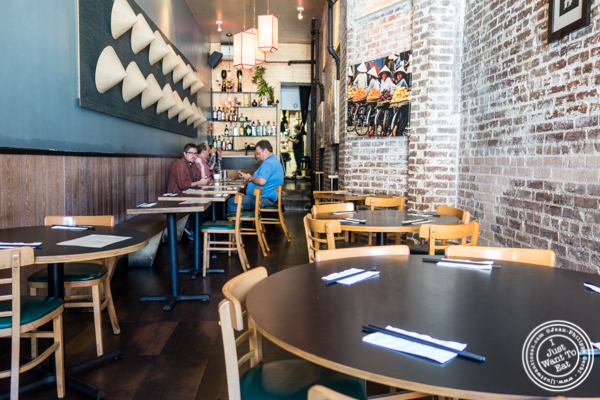 Co Ba is not that big, quite narrow in the back, with a simple but nice decor. They offer a menu with various Vietnamese specialties such as pho, but also some that seem to be a fusion, like the Co Ba tacos. But, as we had plans for dessert, we decided to stick with the banh mi. Jodi went for the banh mi chay, the sole vegetarian sandwich, made with tofu and shiitake mushrooms. On my side, I ordered the banh mi thit composed of cold cuts and chicken liver pate. Interestingly, the sandwiches come with jalapeño, but they were served on the side (Jodi asked for hers without). These sandwiches were just ok, having more bread than anything else and in fact a bread with a thick crust that was dry because slightly overlooked. As a drink, we tried their special made with fresh squeezed lemon juice, kumquat and mint, a quite refreshing beverage. Overall it was disappointing. If you want to eat a banh mi, Co Ba would definitely not be a first choice. 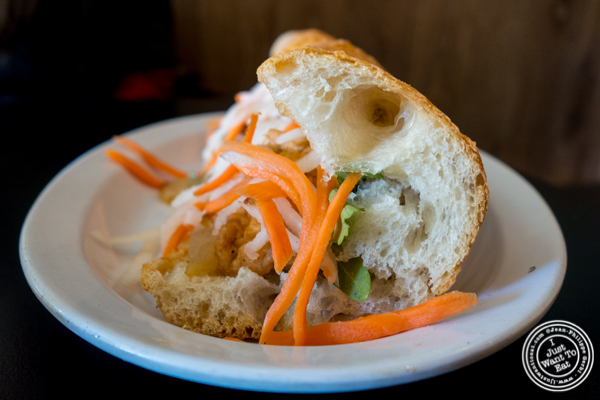 In fact I would go to Banh Mi Saigon Bakery that is fantastic!